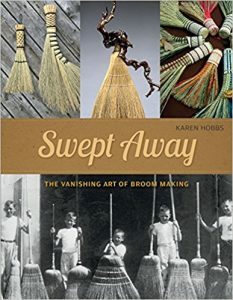 Broomcorn, broomsticks, turkey wing whisk brooms, hearth brooms, kitchen brooms, angel whisk brooms, broomstick cake and more all in a new book by basket maker, gourd artist and broom maker Karen Hobbs. 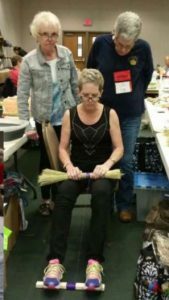 “Swept Away, the Vanishing Art of Broom Making” is scheduled to be released this December (2017). Karen has been making things since her grandmother taught her to sew her own Barbie clothes on a treadle sewing machine. Crocheting, cross stitch, pottery, painting, embroidery – making things was part of life. 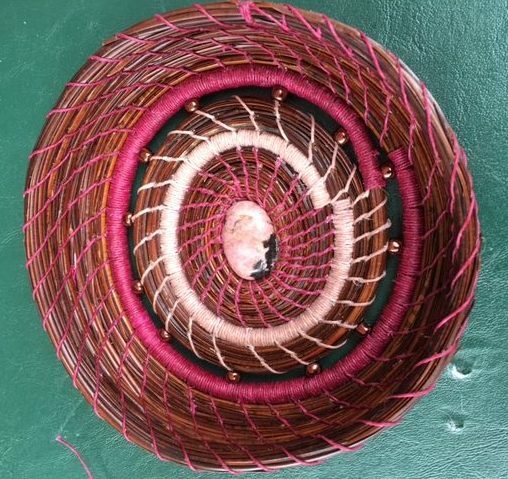 When Karen got out of the Air Force in 1986, she added coiling pine needle baskets to her long list of things to make. 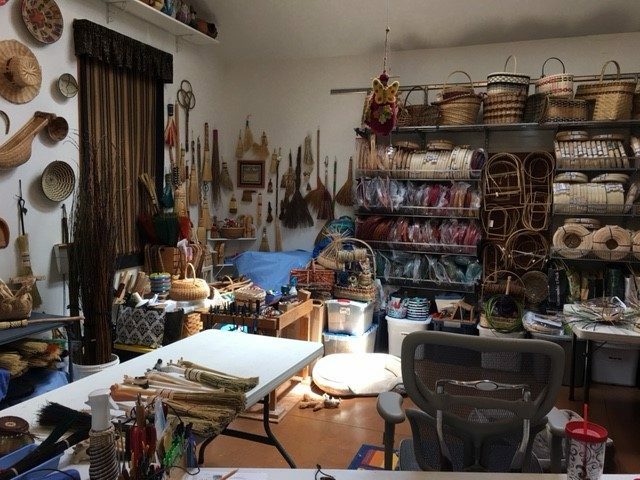 After moving to Austin in 1996, a friend at work introduced her to Jill Robinson and after taking classes for a few years, Karen started teaching basketry. By 2005, she was teaching at basketry conventions and retreats around the country. In 2007, Karen decided travel to North Carolina and take a class at the John C. Campbell Folk School. Cisco, her husband, decided he would like to come along and take a cooking class; so he started to look through the catalog and found a Cajun cooking class he was really interested in. Unfortunately the Folk School was not offering a basket class the same week. What was Karen going to do? Try a broom class! And she was hooked after the first day! 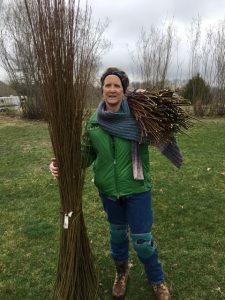 She took copious notes, dug all the scrap broomcorn out of the garbage, took lots of pictures and she checked out all the brooms around the folk school. In the evening, back in her room, she made a cake tester broom with her broomcorn scraps all by looking at the cake tester broom in Cisco’s kitchen classroom. Looking for more information about broom making, Karen went to the Folk School bookstore hoping to buy a book, but she was told that there were no broom making books available. In fact, all the copies of the last one written had vanished in a warehouse fire. This was the moment Karen decided to write her book. The rest of the week she documented everything in class and started her ten year journey of making brooms and researching broom making. Her decision to write the book may have seemed spur of the moment to everyone in her class that week, but she was dead serious. Initially, she was motivated by the fact that there were no books available. As she learned and experimented, she became more and more motivated. Karen wanted to share the art, knowledge, history and traditions of broom making. She wanted to encourage people to make a broom – to keep this vanishing traditional craft alive. So, even though Karen was working fulltime as an operating nurse, she researched broom making every chance she got. She got to know a local broomcorn grower; his family had been growing broomcorn for generations and he willing shared his knowledge of broom history and photos. Karen and Cisco were able to travel to Arcoloa, Illinois for the Broom Corn Festival. 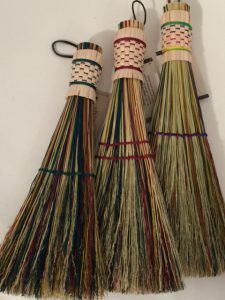 And, while seeking master broom makers in the United States and overseas, Karen went to Alabama to study with the Thompson’s and to learn how to dye broomcorn hurl. And Karen made brooms. She bought a kick winder and eventually a tine winder to aid her studio broom making. Five years ago (2012) Karen began teaching broom making. Her work is beautiful, traditional and yet, uniquely hers. A few years ago, I purchased one of Karen’s brooms – it hangs in my kitchen. Now I can’t wait to read her book! 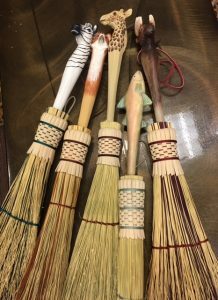 In ‘Swept Away’ you will find chapters on the History of Broom Making, How to Grow and Harvest Broomcorn, Sorting Broomcorn, Care of Brooms, Broom Lore and Superstition, a Photo Gallery of Brooms, as well as, Five Step by Step Patterns (with photos) and a recipe for Broomstick Cake! Swept Away is $24.99 + $5 shipping and handling. Want to find out where Karen is teaching basketry, gourd art and broom making and exhibiting her work? Karen continues to design and weave baskets, she loves weaving with willow and has started to grow her own. Basketry, gourd art and broom making continue to call to her. Karen feels strongly that “these traditional handmade crafts can’t be made as well or as beautifully by machine or on an assembly line. It is important to keep the vanishing skills of our ancestors alive” She wants her students and customers to have access to the uniqueness, creativity and quality of handmade. And so she teaches in her studio and at events around the country. Karen also regularly exhibits her work. Visit Karen at one of her shows or take a class with Karen – you will be glad you did! Karen thank you for letting me interview you! I always love talking to you, but it was a special treat to learn more about your up coming book! I can’t wait to get my copy! Thanks for reading the Basket Teacher! Thank you Karen … I don’t know about me being important, all of us in the basket community work to inspire and encourage each other. You and your book are an important part of the traditional arts world! Can’t wait to get my copy! I love Karen!! Not only talented but just a sweetheart!! I’ve ordered five of her books! !